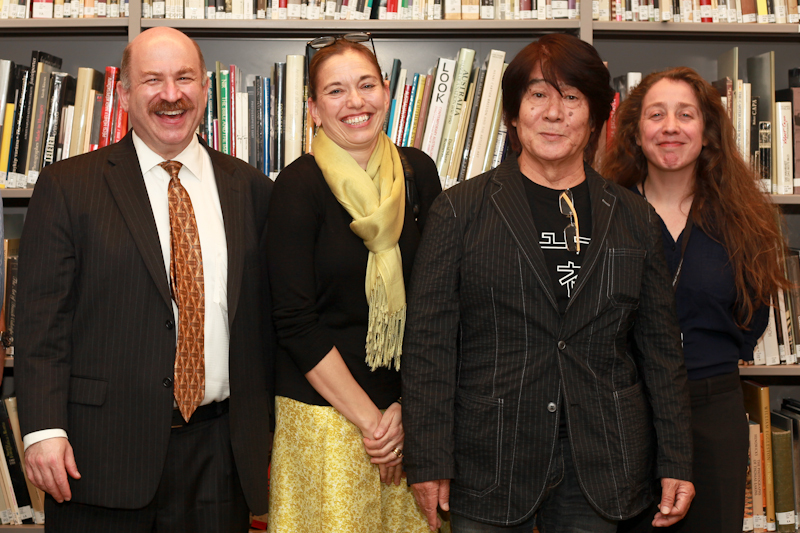 Daidō Moriyama popped into the ICP library on May Day. The pop up library event for Daidō Moriyama was a cool and quiet celebration for one of the true legends of photography. Jazz played, prosecco was sipped and there was a real chilled and excited vibe. Guests mingled hands and glances and calmly nodded in the direction of the great Daidō Moriyama as they browsed his photobooks. Some patrons watched the media show on the screen which was showing scanned images from his books and some materials from his artist/vertical file. Daidō was a rock star, sitting quietly, flanked by his ‘handlers’ and autographing page after page of his exquisite photobooks. The Daidō Moriyama pop-up library shall be on display at the ICP library until May 23. The ICP library would like to say a HUGE Thank you – Domo arigato gozaimasu – for their kindness and excellence to: Russet Lederman, David Solo, Jeff Gutterman, Ivan Vartanian, Akio Nagasawa of BLDGALLERY and Daido Moriyama. I cannot say that we have all of his books [yet] but we are getting there. . . This entry was posted in artists' books, Events, Friends of the Library Committee, International, New Acquisitions and tagged Daido Moriyama. Bookmark the permalink.